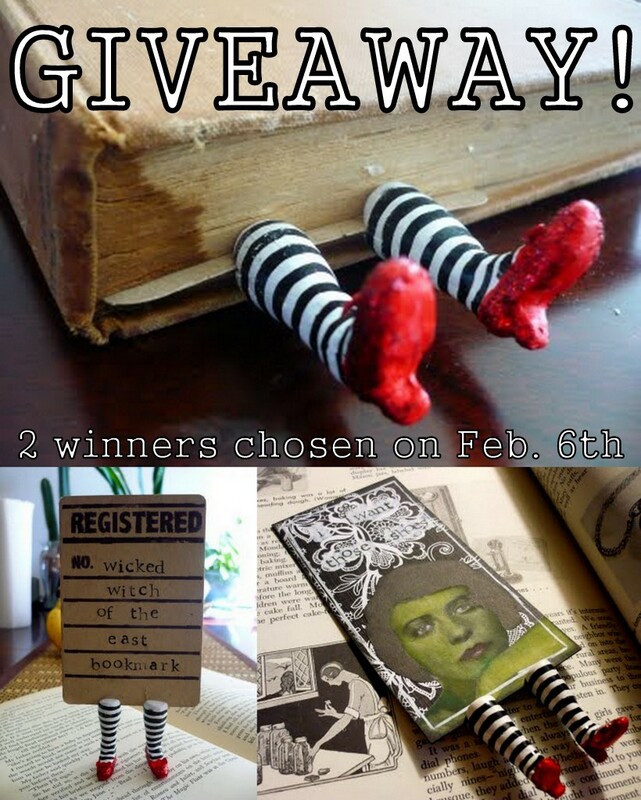 CLOSED: Wicked Witch/Ruby Slippers Bookmark Giveaway! CLOSED! Thank you to those who entered! Hey friends! In order to celebrate 1000 likes on my Oops I Craft My Pants Facebook Page, I'm doing a DOUBLE giveaway! 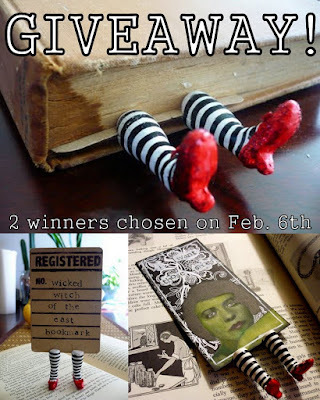 By popular demand, I'll be giving away two of my Original Wicked Witch/Ruby Slippers Bookmarks to two lucky readers :) Up for grabs are one of each style bookmark: 1. The "REGISTERED" Ephemera-Style bookmark here on the blog and 2. The "I want those shoes" Collage-Style bookmark on Facebook. You can enter for both giveaways by commenting here on this blog post, and by commenting on the giveaway announcement on the Facebook Page! This giveaway is open to international folks as well. You can only win once, just in case you're crazy-lucky and happen to be chosen twice. Winners will be selected by random.org's random number generator and announced on February 6th 2012. So comment away! Make sure you leave a way to contact you in case you win :) Thank you for following my work! I 100% appreciate all your support! Ah, the unconventional birthday card... I made this "AW SNAP" card for my little sister (technically, she is my BFF's little sister, but I never had one, so I've taken her as my own). Anyhoo, it was her birthday this month and she needed something colorful, I decided. You can kinda see the metallic craft foil stamped designs in the background. That was probably my favorite part aside from the fluffy pom-pom yarn embellishment. The letters were stamped onto water colored paper and made "3D" with some sticky back foam. In stamp-related news, Bobby made me this shelf for my rubber stamps! Unfortunately, it doesn't fit all my stamps, but the good news is that it was easy to make... And my birthday is coming up. Maybe he'll make me another one :) Have a super week. PS. I'm almost at 1000 likes on my Oops I Craft My Pants Facebook Page! Once I hit 1000, I'm going to have a giveaway. Any suggestions for what I should give away? I finished up yet another canvas board notebook last night using some of the supplies I bought on clearance at Michael's this weekend. They were having a ridiculous clearance! The black and white glitter tape ("Bling on a Roll") was like 79 cents, and the phonograph rub-ons were 9 cents. NINE. I went nuts. I used papers in different shades of pink for the inside pages on this one to match the outside cover. The fun crap on the side is eyelash yarn, fun fur and ribbon. Watch gears! It's like a steampunk old-timey song blasting out. Anyhoo, happy Tuesday! I've been meaning to do this post for a while now and am FINALLY getting around to it. I just posted it on Craftster, so now I'm posting it here on m'blog. I do not have an awesome camera. In fact, I have a pretty basic point-and-shoot digital camera ( Panasonic Lumix DMC-FX12, I think it's outdated and they have a newer model a few times over.) But I like to think that my pics are alright! They used to be "meh" but they're better now! I wanted to share my photo set-up in case anybody was wondering how it's done. I had seen make-your-own-light tent tutorials around the internet, and after looking at several and getting tips from other bloggers, I came up with my current set-up. 1. The light tent is made out of a big clear plastic tote on its side. Many people suggest making it out of a cardboard box with the sides cut out, but this seemed much easier. Any opportunity to avoid using a box cutter, am I right? ;) The suggestion for using a plastic tote came from Saint Angel. 2. To diffuse the light coming in from the sides, I taped sheer white fabric to the outer sides of the tote. I actually used the lining of a skirt I had ripped apart, so it was pretty sheer. 3. I attached 2 small work lights to the shelf(found them at Walmart) and pointed them at each side. I used the GE Reveal light bulbs that are more similar to natural light. My photos still turn out a little yellow, but not as terribly yellow as with normal bulbs. I just fix that on the computer by hitting "auto-color". 4. The background is white posterboard trimmed down to fit inside the tote. There are 2 pegs that I drilled holes for to keep the posterboard from sliding out. You can use pushpins, too, but it takes some muscle to sink them in the plastic the first time! Also, you can choose other colors of posterboard if you wanted. I have a black sheet of posterboard behind the white one to swap out when I want a dark background. So that's that. I always take the photos with the flash off, then once I put them on the computer, I hit "auto-color" and "auto-contrast" in my editing software (I use Picasa), and it's good to go. I hope this info is useful! Happy Monday! This weekend I've been getting busy making canvas board notebooks! I'm starting to grow a healthy relationship with my bind-it-all machine... We weren't friends before, friends don't pinch the heck out of me. But lately I've been learning to avoid serious injury while using it. The narwhal is a watercolored drawing. I had a friend specially request a little bit more narwhal in her life, so I made this for her. All three of these notebooks are made from 5x7 canvas boards which I painted and stamped then cut in half width-wise to make the covers. The last one is pretty simple with a little birdy that was cut out of a nature encyclopedia. I kinda screwed up on the back cover and punched holes in the wrong side. Oops. I think it still looks alright, don't you? :) Oh well, the ostrich makes up for it. I, for one, DESPISE making multiple trips to the grocery store in one week! The lines, the crowds, the parking lot, the "People of Walmart". It all makes me nervous and I'm not shy to say that I highly value quiet time at home! So anyway, for mostly the purpose of making a complete shopping list, I've been planning my meals by the week for almost 3 years now. This way, I go to the store once a week (unless Bobby needs candy or I forget something) and I have everything I need. I can avoid awkward moments with strangers. And for your own personal use, here's a free (FREEEEEEEEE!) printable in case you want to join in the fun. Remember, if your family doesn't approve of the meals, tell them "You'll eat it and like it!" I made this little book for a special craftster a few weeks ago. I used this quote from Carl Sagan because I thought it was definitely a good one about imagination :) Happy Saturday, everyone. I hope this weekend was filled with ideas! It's remotely possible that you may remember this sealife embroidery from a zippered pouch I made in 2010... A kind reader asked if I sell the pattern, and I thought, gee, maybe I should. But then I had a better idea to make up the pattern and provide it gratis. It is the first embroidery pattern I have ever made, so feedback is appreciated! Let me know if I'm missing any special embroidery symbols or whatnot. The dots are all french knots, but I wasn't sure if I needed to put that on there. If this pattern looks alright, perhaps I'll start listing some others in my Etsy. Enjoy! PS. Personal use only, please! If you use it to sell, you may find yourself being punched by a werewolf. Hey! I'm finally using up a little bit of my enormous bead stash. Tonight I sat down at my table surrounded by beads and made this messy, but lovely sea crown. I began with 4 loops of wire, then wrapped it all around with more wire. Then I strung beads onto a long length and wrapped those around what would be the back, spacing the beads out semi-evenly. For the front, I twisted wire and beads willy-nilly to make the front taller. I wanted it to look kinda messy, so it wouldn't show much where I had to snip off and begin new pieces of wire. I'm a mermaid. Happy Thursday! I mentioned that 50 Projects in 2012 Craftalong on Craftster, and I'm already jumping in! Here's my first completed project to cross off my list for this year. I made this red colored birdy necklace/bracelet. This picture shows it as a bracelet, but a chain can be added to the back to wear as a necklace. I've had a few of those little coral hummingbird beads forever and haven't done much with them. I did the wire work myself. There's something therapeutic about sitting down in front of a TV show with beads, round-nose pliers and a spool of wire and chaining stuff together. At some point, I want to make a big long multi-colored chain necklace... One of these days. Happy Monday!